Over the last year, I have been reviewing picture books for Susanna Leonard Hill’s Perfect Picture Book Friday. That means that I read an incredible number of picture books to find ones that I love. If I am going to spend my time reviewing a book, I want to think it is special enough to share with others. Today, I am reviewing a very special book by Leigh Hodgkinson. This is the third book of hers that I have reviewed for Perfect Picture Book Friday. I think it’s safe to say that I adore her style. If you would like to read the reviews for her other books, you will find Boris and the Snoozebox HERE, and Goldilocks and Just the One Bear HERE. 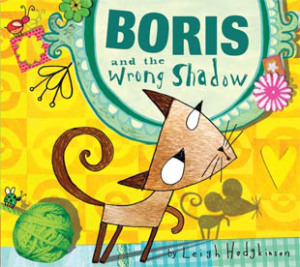 Synopsis: (from Tiger Tales) Boris wakes up from his catnap to find that he has the wrong shadow. Someone has switch-swapped it and left him with a small (and embarrassing) mouse shadow. Boris sets out to solve the mystery and show a small friend that you don’t have to be BIG to feel like a superstar! Witty humor and clever collage illustrations combine in Leigh Hodgkinson’s dazzling follow-up to Boris and the Snoozebox. Without a shadow of a doubt, readers will want more of this quirky cat hero! Opening: Boris had just woken up from his catnap. He smiles as he remembers his dream…swimming in a gigantic bow of creamy milk. Now that he is wide awake, Boris is feeling funny. Not ha ha but funny strange. Boris has a feeling that things aren’t quite as they should be. For some reason, Boris appears to have the wrong shadow. He has no idea why, but Boris decides not to let a silly thing like this…spoil an otherwise pleasant afternoon. Resources: HERE is an excellent Reading and Teaching Guide by the author, Leigh Hodgkinson. Activities include shadow tracing, shadow puppets, and shadow art collages. (An interesting note: If you look up Boris and the Wrong Shadow or Boris and the Snoozebox, you may notice that in the UK, Boris is called Colin. So, the crafty activities on Leigh Hodgkinson’s website say Colin…but Colin and Boris are one in the same.) HERE are crafty activities from Leigh Hodgkinson’s website. Click on the button. That will open a new window. Click on the button again, and then click on Crafty Bits. There are several fun crafts to do with Boris (Colin). Why I Like This Book: I really connect with Leigh Hodgkinson’s sense of humor. I chuckled numerous times as Boris realized a mouse shadow could present some problems. Then I continued laughing when he goes in search of a solution and meets up with Vernon (the mouse who swip-swapped shadows), and realized there will have to be some compromising. The creative mixed media illustrations are very appealing. I found myself lingering on every page wanting to take in every detail. As in her other books, she uses different font sizes and styles to emphasize words and it is very effective. I was thoroughly entertained throughout the entire book. We’ll have to introduce Boris into our household. Sounds like a great one for my kiddo’s age and a great one (for me) to study! Oh I knew this had to be your review. A cat with a wrong shadow, has to be a funny read. I love coming here to see what you have picked up next and always put a smile on my face. Thank you, loved it Penny. I’m glad you like the books I review. I really appreciate your comments, Diane! I had an idea like this in my PiBoIdMo notebook. Well, at least I hadn’t worked on it yet! Don’t ya hate it when that happens! I had one in my PiBoIdMo that I thought was genius. It was my favorite. I always to a thorough Google search before I start writing. A book with almost the same title came out fall 2012! Whaaaa! How adorable! And it looks like the shadow he gets is that of his arch-enemy. Yes! It’s so fun and so cute. I imagine your boys would get a kick out of it. This sounds so funny, Penny! It’s great to find a writer who appeals to you so much. I will look for this one. I think you’ll love it, Carrie! Her books do appeal to me. I just love her illustrations. Now that is a concept I haven’t seen before! I do prefer the name Boris, but how interesting that they changed it after it was originally published. Fascinating. It’s really cute, Amy! I like the name Boris better, too. It really fits his personality as does the name, Vernon, for the mouse. Inquiring minds need to know, does the shadow look more like a Boris or a Colin? I find my shadow looks rather suspicious at times too! Hmmmm! I would say Boris…yep, Boris for sure! No, but you can get good cinnamon rolls and toffee from a place called Vern’s here – maybe I picked up his cousin on my last visit! Maybe so! That would be a well-fed mouse—cinnamon rolls and toffee! Seriously…I’m no longer thinking of the mouse and his shadow…I’m thinking of cinnamon rolls and toffee! Love that cover for beginners. And, I love this quirky cat fun. What a great story. Wish I thought like that. I love quirky cat fun, too. In fact, as I was writing the review, I decided I have a thing for quirky cat books because I also love Bad Kitty books, Splat the Cat books, and Pete the Cat books! Meow! Thanks for the recommendations — my granddaughter is into cats right now. She love the “Little Bo” series. Yes it is! Boris has the funny thing going on! Thanks for making me aware of this delightful-sounding book. I love Picture Book Friday! Hi,Laura! I’m so glad that you stopped by. And, yes, this is a fun one. I think you will be delighted! How fun!!! And how fun also that Boris is U.S. for Colin lol. Hi Catherine. I hope you get a chance to read it. I think you would love it. This book sounds delightful, Penny. Isn’t it so fun when you find an author whose books you just love? Then you can look forward to reading everything she’s written 🙂 I love that in the UK Boris is called Colin – why couldn’t he have been Colin here too? Thanks for sharing this fun book – and I’m very curious to know how the shadows got swapped and how they got switched back! It is very interesting that they changed the name. I did a little research, and I found this response in the comments on a blog that mentioned Boris and the Wrong Shadow. It appears to be from Elisabeth Prial, Publisher at tiger tales. We’re so glad you enjoyed Boris and the Wrong Shadow. And that you prefer the name Boris for this quirky cat. Connecting with kids and the adults that share books with them is such a privilege. As for the title character’s name, we thought that the name Colin just didn’t have the same appeal. So glad you agree! If you enjoyed this title, you may want to check out the first title, Boris and the Snoozebox. Looking forward to publishing more fancifcul and engaging stories in 2010 and hearing your feedback on those as well! Penny, I laughed out loud at the premise. Clever! The art does look intriquing. I wrote it on my library list. I think you will love the artwork. It is really amazing. Visiting Leigh Hodgkinson’s website is a treat, also. It’s whimsical style is very appealing. (sigh) Love those uber-talented author/illustrators! Me too! How wonderful to be able to tell a fantastic story AND illustrate with such talent!!! This sounds so clever, quirky and fun. I love discovering authors I really connect with! You nailed it, Joanna…clever, quirky and fun! I really like this one too! Thank you for reminding me to dig Boris out of the closet.